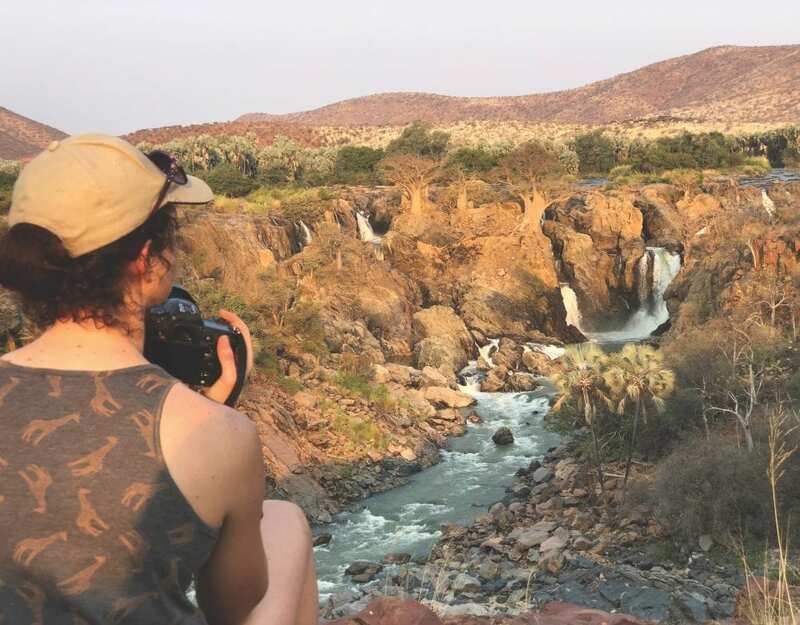 A view of Namibia from the top is a once in a lifetime adventure. Hot-air ballooning is like a magic carpet ride. While you fly, you feel no turbulence, as you are travelling at the current wind speed. The tranquillity of your flight will give you unsurpassed views and plenty of photographic opportunities. The pilot is able to control his altitude perfectly, but has no steering wheel. He controls his direction by choosing the wind channels he finds at different levels. The ground crew has permanent radio contact with the pilot. Except for the occasional roar of the burner, the balloon is enveloped in total silence and the basket is a perfect platform from which to view the landscape below. At Sossusvlei the hot-air balloon takes off as the sun rises over the world’s oldest desert. The splendour of the Namib plays out in front of you as you soar with the winds for an hour over the ocean of sand and mountains. Below is an endless vista of shadow and light, red dunes intermingling with dark mountains linked by pristine gravel plains. 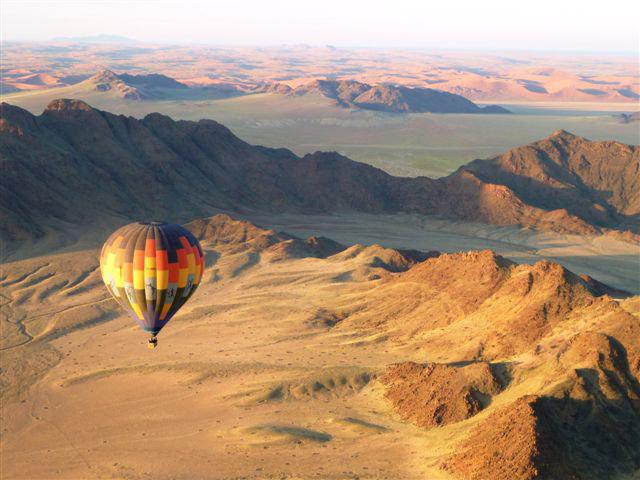 A balloon flight over the Twyfelfontein Conservancy will give you a bird’s-eye view over magnificent Damaraland desert scenery, which includes a unique variety of desert flora and fauna and fascinating geological formations. At Swakopmund you can enjoy an early-morning balloon flight and experience the contrast of the desert with the Atlantic Ocean as you drift along the coast. 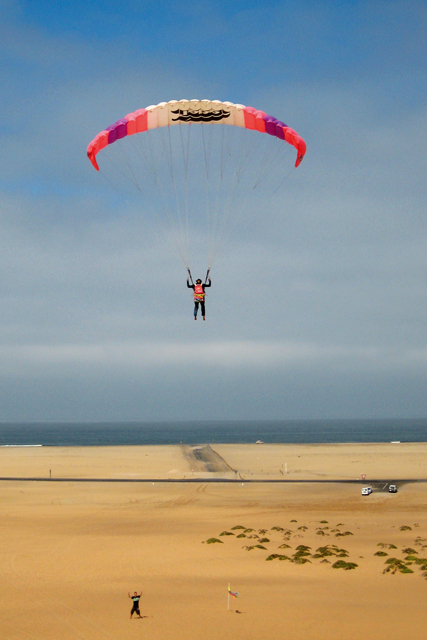 The dunes south of Swakopmund provide among the safest locations in the world to learn the art of paragliding. Even Europeans used to berg-wind conditions travel to Namibia to train in the harsher conditions of the interior. The dune belt between Swakop and Walvis Bay, especially the dunes overlooking Long Beach (Langstrand), are favourite spots. The fresh south-westerly winds offer ideal ‘lift’, and once air-borne there are spectacular views of the desert and ocean. Namib Gliding offers a half-day introductory course that includes at least two ground-skimming flights, full day flights, a basic pilot’s licence course and tandem flights. Paragliding enthusiasts occasionally undertake powered paragliding excursions along the coast. In Namibia paragliding is usually done with a guide who knows the conditions and flying sites in Namibia. You are strongly advised not to try this on your own. Activity operators offer experienced guides and instructors to help you make your dream holiday a safe and enjoyable one. The Namibian coast, where the dunes range from 70–150 metres, is one of the great training and fun-flying sites in the world. The dunes are regulated by the local training school to insure safety and reduce overcrowding. 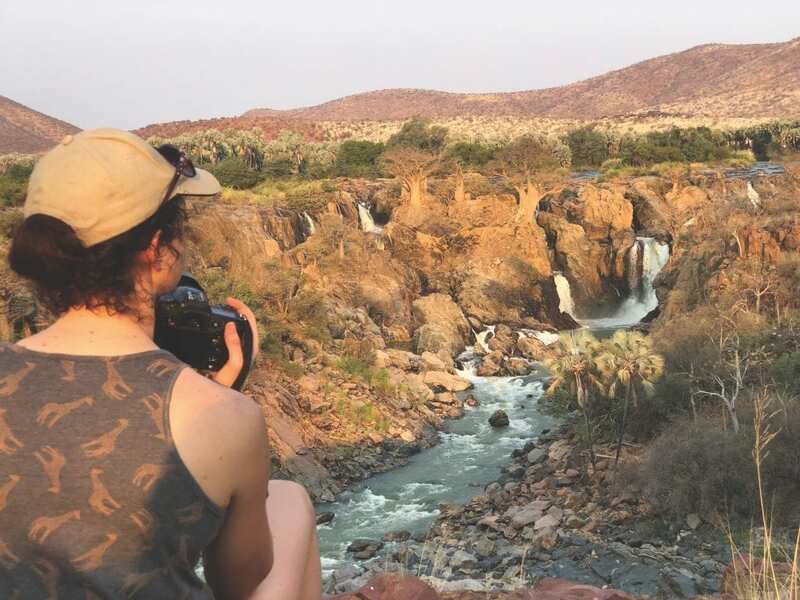 Current tours are offered from October to March, which is the main season and the best flying times in Namibia. Tours include all transfers, specialised training in strong wind, reverse launch techniques, accommodation, guiding and permits. Namibia’s premier drop zone is located just outside the coastal town of Swakopmund. The scenery viewed whilst floating under an inflated- parachute is simply breath-taking. Some skydiving clubs have been operating since 1980, carrying on a long tradition of high-quality sky-diving, training and fun that has always been associated with the coastal town. There are two skydiving clubs in Swakopmund that offer a professional training service. If you are already a skydiver, you can arrange a scheduled jump, and if you are a novice, there are two options. You can complete a one-day training course that will qualify you for a static line jump on the same day, meaning that you are tied to the aeroplane with a special cord that automatically opens your parachute. Or you can do a much shorter course and complete a tandem, freefall jump. A tandem jump means that you are physically strapped to a qualified instructor. You jump out of the plane together, freefall for 30 seconds or so, and the instructor makes sure your parachute opens. Tandem jumps are offered daily by operators in Swakopmund. When skydiving, the tandem pair boards the aircraft at Swakopmund airfield. The plane ascends to 10 000 feet, at which point the tandem exits the aircraft. After a 30-second free fall, the tandem master opens the parachute and the tandem pair glides down to a tiptoe. The name Bitterwasser has become synonymous with the sport of soaring (also referred to as gliding) ever since the late Peter Kayssler began logging vast distances on his farm in the early 1960s. A combination of the ideal altitude (1 250 metres), stable weather conditions and clear skies creates conditions reputed to be amongst the best in the world. Between November and January, the high season for soaring, Bitterwasser becomes a hive of activity, with soarers from Germany, France, Switzerland, Belgium and elsewhere descending on the centre. Soaring altitudes vary from 2 000–4 500 metres. In December 2000 the world record for the fastest 750-km triangular flight was equalised with a speed of 161.35 km/h. Several national and international records have been set at Bitterwasser. Guest Farm Kiripotib also offers gliding activities.